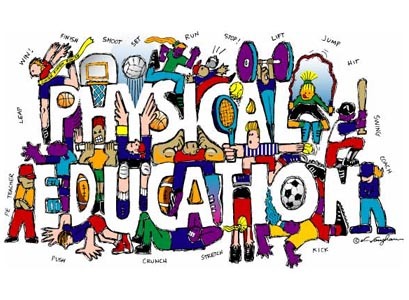 Students are REQUIRED to dress out and participate on a daily basis for P.E. 1/3 of their grade is based on dressing out, 1/3 is participation and 1/3 is a quiz or test. Students receive a separate grade for each and they are averaged together for their 9 weeks grade. The first nine weeks will be spent on the team sport of basketball. Basketball was first developed in 1891 by James Naismith as a way for athletes to keep themselves in shape during the winter months. He was the Physical Education Director at the International YMCA Training School (now Springfield College) in Springfield, Massachusetts. The early basketball games were played with a soccer-style ball and peach baskets. There was also no limit in the number of players or balls that could be used at once. It was not uncommon to see a game with 50 players and 5 balls. In 1892, Naismith developed 13 simple rules to help govern the game. Some of these rules are still used today. The rules of the game were published in a national magazine and its popularity spread quickly throughout the United States. The game grew so fast that the first intercollegiate basketball game was played in 1896. In 1936, basketball became an Olympic sport. The object of the game is to advance the ball toward your opponent’s basket (by dribbling or passing) and to score more points than your opponent by shooting the ball through the basket (field goal) or from the free throw line (free throw). Each team attempts to score points as they move the ball down the court by passing, dribbling, and shooting it into their basket. At the same time they try to prevent their opponent from scoring. •Timed periods will be played. •The start of each period will begin with a jump ball. •Colored lines mark the boundary lines for each court. •All baskets are worth 1, 2, or 3 points, based on court size and lines marked on the floor. •If the ball touches the boundary line it is considered out. •If a player touches the boundary line while in possession of the ball they are out. •All fouls result in the opposing team putting the ball in play from the sideline, nearest the spot of the foul. •No foul shots will be taken, this rule speeds up the game and reduces wasted playing time. •Technical Foul (unsportsmanlike conduct of any kind). •All violations result in a turnover (the ball goes to the other team). •A player, in possession of the ball, is moving without dribbling the ball. •A player jumps with the ball and lands before releasing it. •A player with the ball moves his pivot foot without dribbling. •Dribbling the ball with both hands at the same time. •Dribbling the ball after picking up the original dribble. •3 Second in the key – An offensive player cannot stand in the key are for more than 3 seconds. •5 Second Call – taking five seconds or more to inbound the ball. •10 Second Call – taking 10 seconds or more to advance the ball past the mid- court line. •Once the basketball has crossed the mid-court line, it cannot cross back over the mid court line. •Timed periods will be played, based on teacher discretion. •The start of each period will begin with a team passing the ball from out of bounds. •All baskets are worth 1 or 2 points, based on court size and lines marked on the floor. •Minimal body contact should occur between players at any time. When body contact is made a foul will be called on the responsible player. •No tripping, pushing, hacking, blocking, grabbing, etc. •No reaching in (hitting a player when reaching for the ball). •No charging into a stationary player. •Center – (1) usually the tallest player and plays close to the basket. •Guard – (2) usually shorter players, they have the best ball handling, passing and shooting skills. •Assist: A pass made to a teammate who scores. •Defense: Team not in possession of the ball. They are defending their own goal. •Double Team: Two defensive players guarding one offensive player. •Key (lane): The painted area extending from under the hoop to the free throw line. •Jump Ball: The way each game is started. The referee throws the ball up at center court. •Lay-Up: A short shot that is taken from one or two feet from the basket. •Man-to-Man: Defense involving each player guarding one offensive player at all times. •Offense: The team in possession of the ball who are trying to score. •Pivot: A stationary foot that is established then does not move. •Protect the basketball at all times! •Create space by moving to the open area. •Stay between your person and the basket. •Play a man to man or zone defense.